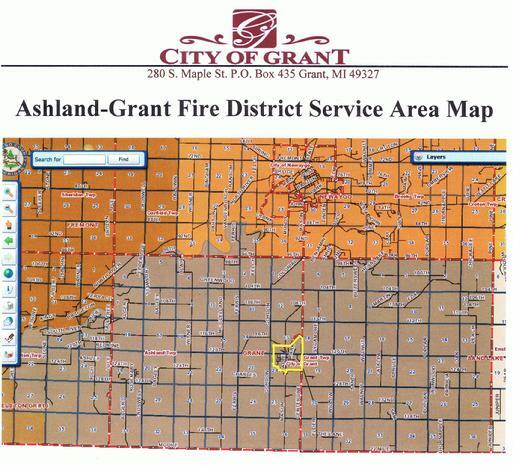 The Ashland-Grant Fire District (mailing address: 11256 McClelland Avenue, Grant MI 49327) is comprised of Ashland Township, Grant Township, and City of Grant. Each municipality appoints Board Members to represent them on all Board matters. The Fire Board is responsible for creating an annual balanced budget and handling the day-to-day operations of the Fire District. Large, capital purchases, are first approved by all of the municipalities before a purchase can be made. The budget is also approved by each municipality before it is adopted annually. Each municipality is individually responsible for levying any millage necessary to meet their financial appropriation obligation written in the Fire Contract, and most are contributing additional funds to help offset costs affiliated with First Responders. Since the millage is levied by each entity, each entity collects the millage and sets it aside in the Fire Fund until it is time to make the annual appropriations payment to the Fire District. Since the Fire District does not levy any millage itself, the contract provides for exactly how payments are to be made to sustain the Fire District and its operations. Understanding fire district funding can be confusing. The best way to understand the make up and funding is to read the Ashland-Grant Fire District Contract. When looking at the Fire District Audit (Uploaded document on Page 9) you will note different amounts paid by the different entities. This is based on a tax millage of .5 mills for operating, .5 mills for equipment for the current audit ended, totaling 1 mill contribution from each one of the three main entities. In the current fiscal year, there is an increase of .25 mill for First Responders that were added in the new fire contract, so in the next audit each taxing member must contribute 1.25 mills total. To understand why one entity contributes more or less than another, one must understand it is based on Taxable Value of property within the jurisdiction. For instance in one year's annual audit, you will see in the previous year ended Ashland Township contributed $87,088, Grant Township $70,082 and the City of Grant $15,680. Pockets of Bridgeton and Garfield Township were billed per call, under charges for services at $16,295. All these dollar amounts (except Bridgeton and Garfield) are not arbitrary, but arrived at by charging the same millage rate in the fire contract by each entities taxable value. As you can see in the map above, Ashland and Grant Townships are very large in size, tax base and population when compared to the City (highlighted in yellow), thus this is why the City contributes and equal share, but smaller dollar amount. Sometimes the City receives complaints from surrounding member citizens who look at dollar amount contributions only and do not fully comprehend that contrbutions are based on size and value. Hopefully by looking at the fire district service map and this brief narrative all citizens have a better idea and better appreciation for the make up of the fire district, who is served and how it is funded. The Fire District will conduct tornado siren testing between the hours of 7pm and 7:30pm on the First Monday of Every Month (spring / summer only).